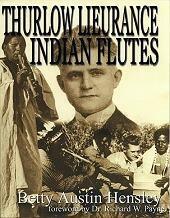 Thurlow Lieurance was one of the first performers to ever use the Native American flute in contemporary music. His well known songs like “By the Waters of Minnetonka”, “Wi-UM”, and “By Singing Waters” were known for his adaptations of traditional indigenous music to the modern stage. He collected several Native American flutes of which 12 have survived the ravages of time and are presented here in this in-depth study by Mrs. Betty Hensley. Mrs. Hensley is an accomplished flutist, having a large collection of world flutes and able to play them all. She brought her knowledge of the wind instrument’s tunings and characteristics to a unique view, found in this book. This new revised edition features the 12 flutes studied as to their history, tunings, tone and unique nature with four pages of color pictures of them. An accompanying CD allows listeners to hear the sounds of the old flutes, and enjoy the melodic works of Lieurance performed by Mrs. Hensley. Published by the Oregon Flute Store - Edited by Douglas Spotted Eagle.